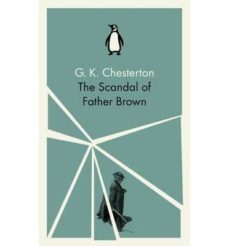 'It would not be fair to record the adventures of Father Brown, without admitting that he was once involved in a grave scandal...It happened in a picturesque Mexican road-house of rather loose repute...' After many years in the priesthood, Father Brown knows human nature and is not afraid of its dark side. In this fifth and final series of mysteries, the clerical mastermind confronts slander, passion, radical politics, superstition, high crimes and misdemeanours, outwitting some quite extraordinary and villainous adversaries on the way. G. K. Chesterton was born in 1874. He attended the Slade School of Art, where he appears to have suffered a nervous breakdown, before turning his hand to journalism. A prolific writer throughout his life, his best- known books include The Napoleon of Notting Hill (1904), The Man Who Knew Too Much (1922), The Man Who Was Thursday (1908) and the Father Brown stories. Chesterton converted to Roman Catholicism in 1922 and died in 1938. "Chesterton knew how to make the most of a detective story". (Jorge Luis Borges).